Like Barack Obama, Timothy F. Geithner, Obama’s choice for Secretary of the Treasury, was born in August 1961, spent part of his childhood living in Asia, and currently enjoys playing basketball. Geithner was born in Brooklyn, New York, August 18, 1961. His father, Peter, worked as an Asian development specialist with the Ford Foundation for 28 years. As a child, Timothy lived in Zambia and Zimbabwe. He attended junior high school in India and high school in Thailand. 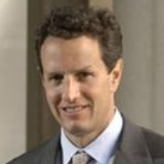 Like his father, Geithner graduated from Dartmouth College and Johns Hopkins University School of Advanced International Studies. Geithner received a B.A. from Dartmouth in 1983 with a double major in government and Asian studies, with a concentration on Chinese, and an M.A. in International Economics and East Asian Studies from Johns Hopkins University in 1985. After graduation, he went to work as a researcher for former Secretary of State Henry Kissinger and Kissinger Associates, the high-level and sometimes secretive lobbying firm founded by Kissinger. Geithner joined the International Affairs division of the Department of the Treasury in 1988 as assistant financial attaché at the U.S. embassy in Japan. During the Clinton administration, he caught the attention of Larry Summers and quickly moved up the ladder at Treasury. Geithner served as the Deputy Assistant Secretary for International Monetary and Financial Policy (1995-1996) and as Senior Deputy Assistant Secretary for International Affairs (1996-1997). Between 1997 and 1998 Geithner was the Department of the Treasury’s Assistant Secretary for International Affairs. His responsibilities included advising the Secretary and Deputy Secretary on international economics and monetary policy developments. President Clinton appointed Geithner a member of the Overseas Private Investment Corporation (OPIC) January 16, 1998. OPIC is tasked with helping U.S. companies invest in developing countries. On December 9, 1998, Clinton promoted Geithner to Under Secretary of the Treasury for International Affairs, where he was responsible for developing and executing U.S. policy in the areas of international economic and financial diplomacy and international monetary policy issues, including exchange rate policy. He played key roles in negotiating aid packages for South Korea and Brazil. Geithner was the first career civil servant to be appointed under secretary for international affairs. He held the post until Clinton was replaced in the White House by George W. Bush. Geithner joined the Council on Foreign Relations and then, in December 2001, moved on to the International Monetary Fund, where he was the director of policy development. His responsibilities included crisis management. Geithner was named president of the Federal Reserve Bank of New York on October 15, 2003. He was considered by some to be a controversial choice because he lacked market experience. Again, Geithner specialized in crisis management. He helped orchestrate the sale of Bear Stearns to JPMorgan Chase in March 2008, and, in September, the seizure of Fannie Mae and Freddie Mac, the bailout of the insurance firm AIG, the largest government rescue of a private company in U.S. history, and the non-bailout of the investment banking firm Lehman Brothers. As New York Fed president, Geithner is also vice chairman of the Federal Open Market Committee, the Federal Reserve’s policy-setting arm.